Looking to grow closer in your relationship with God this year? 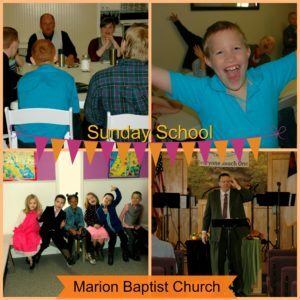 As January is picking up with our theme this year, Prayer… there is much excitement around The Marion Baptist Church for serving the Lord in 2018, Loving God more and Loving our neighbors! God wants a personal relationship with each of us and we can speak with Him directly! Come join us to learn more. Classes Available for all ages including nursery. 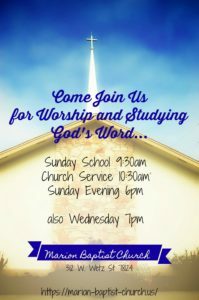 Service is at 10:30am (Children’s church is available after worship and prayer).